Installing an Advanced Pastebin on Rackspace Cloud Sites can be done with Stikked, adding Twitter Bootstrap like interface to make it more attracting, light. Before going through Installing an Advanced Pastebin in this topic, you can read another guide on Installing a Pastebin on Rackspace Cloud Sites. That is simple and serves the purpose. We will guide for Installing an Advanced Pastebin on Rackspace Cloud Sites in this article and provide links for more customization, however, at this moment, supplying a ready made custom package is not possible for time restriction to build for public usage. All steps for this guide for Installing an Advanced Pastebin on Rackspace Cloud Sites ( Stikked in this case ) will follow the basic method of a database creation, uploading the files as described in the guide on OwnCloud Installation. So, first create a database. Then create either a sub domain or a sub folder with your desired name and upload all the contents to the www folder. and edit the base_url value. Configure the database.php file in the same way. Default Database field is the database name. CHMOD the cache and logs directory recursively under system named directory. Import the provided SQL in PHPMyAdmin. In case you get the errors (quite common due to codeignitor part), ask Rackspace support politely (as actually substandard script installation is not their work, but they will help). Modification means changing the look like Twitter Bootstrap. That is quite easy. Follow the “Nothing Way” part of this guide mainly for WordPress. Cloud Load Balancer is a High Availability Cloud Computing based solution which distributes http requests across servers to minimize server response time. Cloud PaaS Development is a fun with Exo IDE Development Environment. You can deploy your Cloud App on Heroku Cloud, AppFog, Cloud Foundry, OpenShift and more. 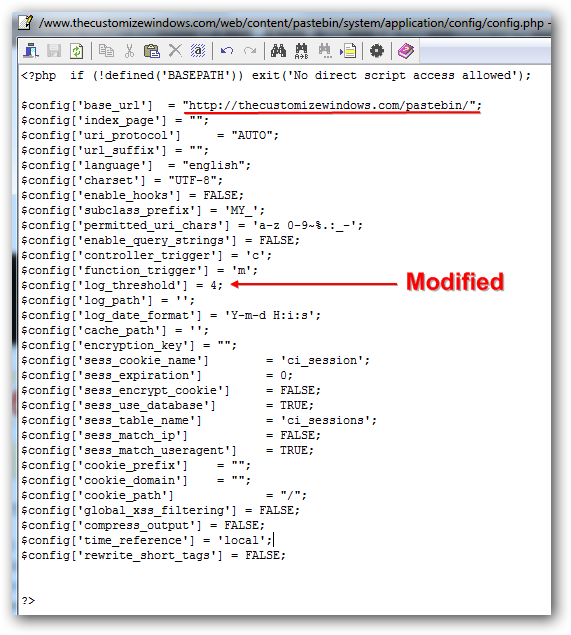 Cite this article as: Abhishek Ghosh, "Installing an Advanced Pastebin on Rackspace Cloud Sites," in The Customize Windows, October 5, 2012, April 23, 2019, https://thecustomizewindows.com/2012/10/installing-an-advanced-pastebin-on-rackspace-cloud-sites-1/.